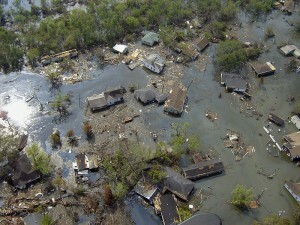 This is a photo of Port Sulphur, Louisiana, taken about one week after Hurricane Katrina struck. Virtually the entire town was destroyed by the combination of high winds and storm surge. Meteorologists try to determine the strength of a developing hurricane so they can warn people in its path about its possible impact. The impact of a hurricane results from many factors. One is obviously its winds. How hard is the wind blowing? Other factors are storm surge, flash floods, and tornadoes. Formerly, meteorologists tried to take all these possibilities into account when categorizing storms but it was too confusing. Now the categories are based strictly on peak winds. The Safir-Simpson Hurricane Wind Scale has five levels. 1 – Winds are 74-95 mph. 2 – Winds are 96-110 mph. 3 – Winds are 111-129 mph. 4 – Winds are 130- 156 mph. 5 – Winds are 157 mph and higher.